So - you've got lots of games coming up. Some of them might be home games - some away. And maybe you've got a different set of duties to assign on a home game vs the duties you need to do away. Or maybe they're the same. Either way - Duty Templates are your best friend. So a Duty Template is how you tell teamstuff what duties are needed on any given game. 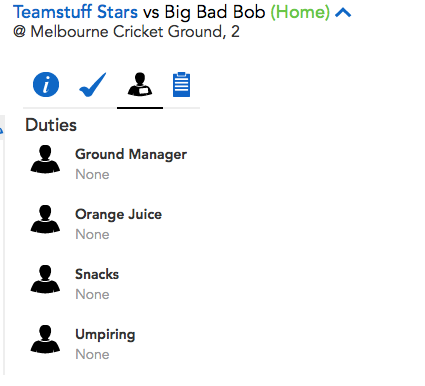 So for example, you might set up a set of four duties for home games - say Umpiring, Orange Juice, Snacks and Ground Manager. 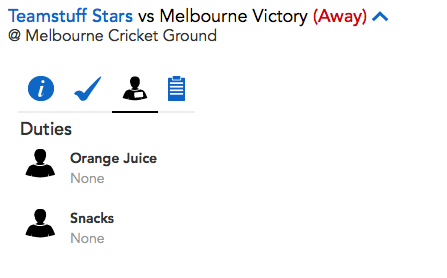 Maybe for away games you normally have only two duties ; Orange Juice and Snacks. 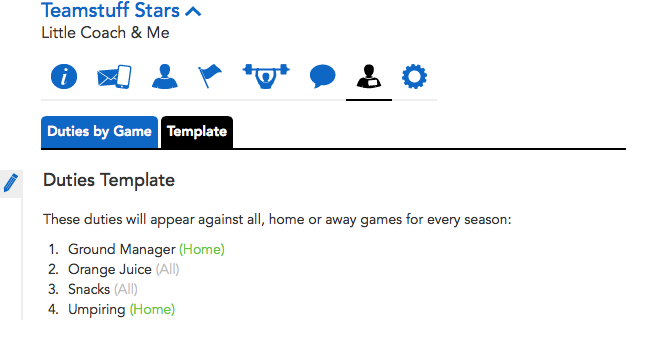 Teamstuff now understands that when you add a new game to teamstuff, the default set of duties - the tempate - is 4 duties for a home game, and two duties for an away game. The duty template won't assign those duties to people yet ( yes, teamstuff can now do this for you ), but it does help work out just how many duties are needed - across all your games.